A question that I inevitably get asked by curious friends and travellers: what has been the highlight of your trip? It's impossible to give a single answer, but there are certain adventures that stand above the rest. We've decided to compile our favorites in a new series called World's Greatest Experiences. This series explores those extra-special, off the beaten path adventures that you won't find in any guide book. Our guides are your insider scoop on where these experiences exist, and how to do them. Our hammock home on the cargo ship to Iquitos! Lunch: Chicken curry with rice. Some of the most gorgeous sunsets we saw in South America. Lunchtime on the ship: Lining up for our communal meals. Qigong lead by fellow traveller, John from England. Throughout the journey the boat docks at isolated villages to pick-up and drop-off cargo, such as plantains. Yoga classes lead my yours truly! Breakfast on the boat: A thick, chocolately soup with as many bread sticks as you can hold. 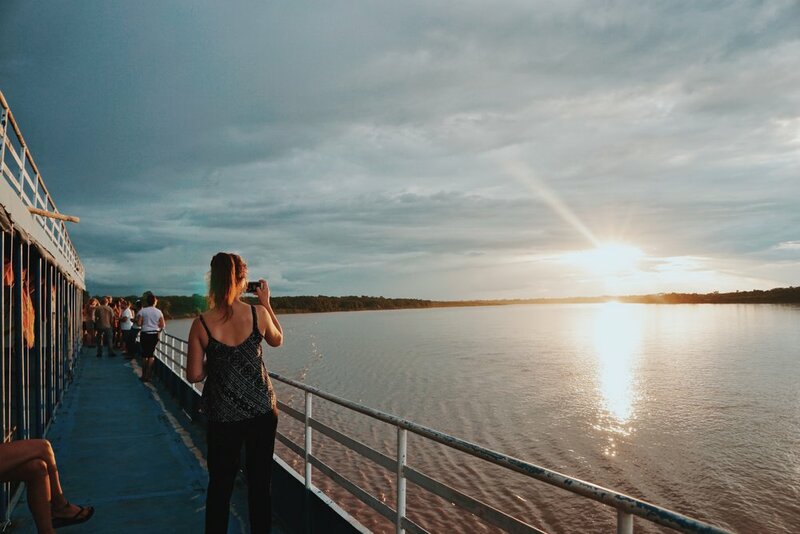 For our inaugural post, we're bringing you one of the highlights of our South America travels: living on a working cargo ship and drifting through the jungle to the Amazon! This three-day voyage is about as off the beaten path as it gets. That said, with a little bit of planning it’s an easy add-on to a Peru itinerary, and I can guarantee you it’s one of the most enjoyable, rewarding, unique experience you’ll ever have. Let’s get to it! 7. How Long is The Ride? Live the boat life, and sling a hammock on a cargo ship that drifts through the jungle for three days to reach its final destination: Iquitos, gateway to the Amazon jungle. It’s really hard to put into words why this boat was so special, so I’ll tell you about my experience on it to give you a better idea. If you’d like to skip ahead to the how-to’s, click here. After a quick colectivo (minibus) from Tarapoto, we arrived in the small port town of Yurimaguas and start seeking out the cargo ship. With only a few weeks of South American travel under our belt and no formal Spanish training, it takes a lot of miscommunication and a few mototaxi (motorbike taxi) rides before we finally find the right port where the Eduardo Gilmer IV departs from. We’re walked through a boating yard that resembles a minimum-security prison and eventually get to a boat named “Gilmer IV” – we made it! We’re told that the boat leaves at noon, and it’s currently 10am. Couldn’t have timed it more perfectly if we tried... or so we thought. Noon rolls around, and the boat is virtually empty. Only a few thousand egg cartons, onions, and three other passengers… We ask the captain when the boat is leaving, and are informed it now leaves at 2pm… That time comes, and the time is pushed back again, and again, and again for the next 24 hours! We end up sleeping overnight on the docked cargo ship as it loads up, slowly filling with cargo and people, until it finally departs the next day in the afternoon. Lesson learned: there is no set departure time; the boat leaves when it’s full. A few of the lovely people we got to know on our days on the boat. The next three days we spend cruising through the jungle, accompanied by about 15 other tourists and 20 locals. In the brown murky waters below us swim pink dolphins, and we’re continuously passing dense jungle – which is surprisingly silent. By day we hang out on deck, getting to know the other passengers. This unique community of travellers from all over the globe is what makes this experience memorable. The people who choose to seek out this journey are some of the best people we have met on our travels: students on break, job-quitters like us, a couple who work for Doctor’s Without Borders, a Brit who used to work for the Saudi royal family, Chilean hippies, musicians, Peruvian environmentalists… a complete melting pot of individuals who are so different, but share the same passion for experiencing travel in its rawest form. Matt and I become the boat’s yoga teachers and lead Vinyasa classes on deck (note: I am definitely not qualified to do this). When the kitchen bell rings, we line up to receive our food at the canteen, eating all our meals communally and taking guesses as to what it is we're actually eating. At night, we play Spanish card games and drink cheap beer. When we’re tired, we fall into our hammocks and sleep on deck with the cool breeze of the moving ship to keep the mosquitoes from eating us alive. All the while, the boat is docking at isolated jungle villages, loading up on everything from motorbikes to plantains. We didn’t “do” much. But the experience of community formed by complete strangers is something that’s so rare to find these days. That’s what makes this ship so special. Iquitos is the final destination, and it is the main gateway to Peru’s northern Amazon jungle. It’s the largest city in the world that isn’t accessible by car. Most people go as it’s a starting point for Amazon tours and many ayahuasca retreats. To get there, you’ve got two options: plane and boat. Prices are per person in Peruvian soles. We bartered for every price, so keep in mind the price you will be quoted will be MUCH higher. As a general rule, you should be bartering for everything in Peru. Important: Make sure you buy your ticket directly from the captain. You should get an official carbon copy of your ticket, and this is used for receiving you meals. *We chose to purchase a private cabin (pictures below); most people just buy a space on deck. The cabin was a small room near the front of the boat that contained two bunks. We didn’t sleep in the cabin (we slept on-deck in our hammocks), but instead used it to lock our belongings. Petty theft is an issue on the boat, discussed below in Safety. The boat begins in Yurimaguas, which is two hours by bus from Tarapoto in north-central Peru. It follows the river north to Iquitos. 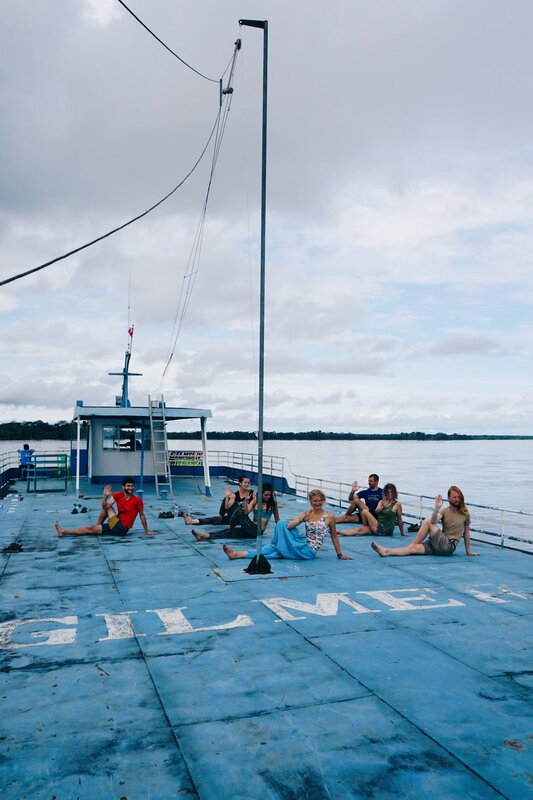 There are many ships that travel the Yurimaguas-Iquitos route, but we recommend the Eduardo ships, like Gilmer IV (there are also other Gilmer ships). These are most frequented by travellers. Be firm and make sure you only get on an Eduardo ship, even though taxi drivers in town may try to drop you at a different port to get a cut of your fare. The boat ride itself is two nights, three days. However, as explain above, it leaves when it’s full… so we ended up living on the boat for more than 24-hours before it actually departed, meaning we spent three nights on the boat (the extra night was free). All items must be acquired before boarding the boat. Stock-up in Yurimaguas before getting a mototaxi to the shipping yard. Hammock: There are many shops in Yurimaguas selling hammocks. Shop around and barter hard, as the price varies a lot for the exact same hammock. We were told hammocks would be available at the port, but this was not the case. Sleeping bag, liner, or blanket for sleeping in the hammock. I used my sleeping bag liner and it was perfect. Water: There is no clean water on the boat, so you need to bring enough for 3-4 days. Insect repellent: I’m brand loyal to Sawyer’s Picaridin Repellent. It’s the only repellent I’ve found that is deet-free and actually works. It doesn’t smell bad, either. Snacks: We brought fresh fruit to balance out the carb-heavy meals provided by the boat. Bowl and utensils: The boat does not provide these, so you’ll need to bring your own for meals. Tip: the bigger the bowl, the more food they’re going to serve you! Soap and shampoo: It gets HOT on the river, and you’re going to get grimy. To freshen up, there are some very interesting showers (see right)… These use the lukewarm, murky river water below. Highly recommended, trust me. 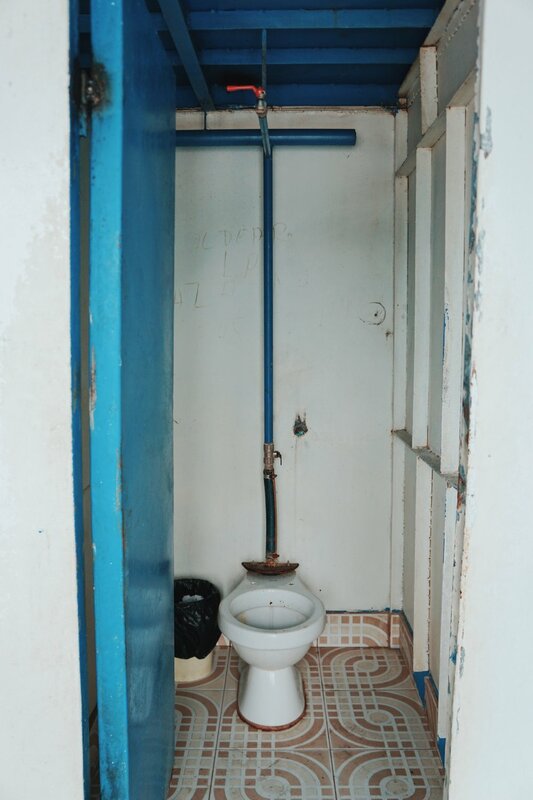 Shower and toilet. You're welcome. Like the rest of Peru, theft is an issue. A few people on our boat had cell phones stolen – but honestly, this was kind of their fault, as they left them charging overnight in an area away from where everyone slept. To avoid theft, practice common sense and don’t leave your valuables unattended. I advise upgrading and buying a private cabin (price above, it’s of negligible cost difference), as you’ll be able to lock your valuables. The boat departs from Yurimaguas. The closest major transportation hub is Tarapoto, and there are regular colectivos from Tarapoto to Yurimaguas (2hr, 10 soles). Once you arrive in Yurimaguas, get a mototaxi to the center of town (ask for "Mercado de Yurimaguas") and stock up on needed supplies (see Checklist). Then get a mototaxi to take you to Puerto Internacional Yurimaguas (10km NW from the town center), where the Eduardo boats depart from. When communicating this, be very clear and firm, as they’ll likely try and take you somewhere else. It’s handy to have a map on your phone (I use maps.me) so you can GPS track that they’re taking you to the right place. From town to the shipping yard, it takes 15 minutes and should cost you around 7 soles for 1 or 2 people. Tip: if they are quoting you much less than this (1 or 2 soles), it’s likely that they misunderstood and will take you to a different port, which is incorrect. By boat: You can continue up the Amazon and catch a different cargo ship to Colombia and Brazil (the tri-border zone). By air: There are cheap flights to Lima on Viva Air; LATAM and Peruvian also fly there. By bus: Not an option, as there are no road connecting Iquitos to the rest of Peru! I can't say enough good things about this cargo ship. If you're looking for something a little different from the norm, open to meeting travellers from all walks of life, and intrigued about boating through the jungle living in a hammock – this one's for you! Questions on planning your trip to the Amazon? Drop us a comment below or say hello @nutritiontraveller. Disclosure: This post contains affiliate links, which help keep Nutrition Traveller running. I personally use every app I recommend on here and truly love them! Looking for more South American Adventures? Post updated on August 24, 2018.